Whether you’re completely renovating your bathroom or updating its appearance, bathroom mirrors from 31-W Insulation can heighten the design appeal of your project. We offer mirrors in a wide range of sizes, shapes, and styles that are suitable for any modern home. Want a sleek mirror with low-profile frames to complement your new glass shower doors? We can provide that to you. Looking for a more ornamental piece with elaborate detailing to blend with the grand décor of your master bathroom? We can offer you that as well. 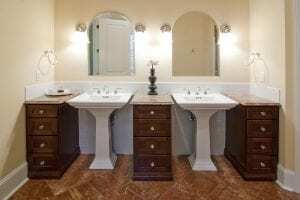 As one of the leading home improvement companies in the nation for more than 40 years, we have the bathroom mirrors and installation expertise to help your Evansville design project become all that you envisioned. Our technicians will install your mirror with masterful attention to detail. To ensure that every project we complete adheres our stellar workmanship standards, only our trusted and experienced employees – not subcontractors – perform our mirror installations. To learn more about our lovely bathroom mirrors, contact 31-W Insulation today and schedule a free consultation at your Evansville home.